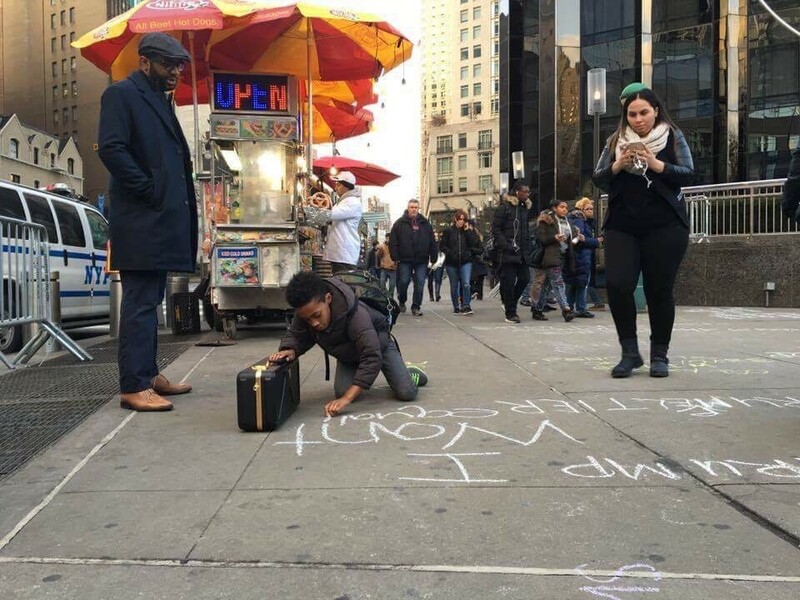 Protesters used chalk to voice their disdain for the travel ban outside Trump Tower. President Donald Trump’s executive order banning travel from seven countries is up in the air, as the Department of Justice and two states head to court to fight over the ban’s legality. Since being issued on Jan. 27, Trump’s executive order putting a four-month suspension on the U.S. Refugee Admissions Program and 90-day ban on travel from seven Muslim-majority countries has been met with much controversy. The abrupt rollout of the order resulted in confusion and protests, as travelers who had previously been granted visas were detained at airports or prevented from boarding planes to the United States. On Friday, Feb. 3, Judge James Robart granted a temporary restraining order on the ban, a move that allowed travel to resume for visa-holders and refugees. A federal appeals court rejected Trump’s administration’s request to reinstate the ban on Saturday, Feb. 4. The fight now heads to the 9th Circuit Court of Appeals, where the justice department and the two states challenging the ban, Washington and Minnesota, have been asked to present more arguments. The order bans those traveling on passports from Iraq, Syria, Sudan, Iran, Somalia, Libya and Yemen from entering the United States for 90 days to “allow for proper review and establishment of standards to prevent terrorist or criminal infiltration by foreign nationals,” according to a fact sheet issued by the Department of Homeland Security. Travelers from Iran, Iraq, Sudan and Syria previously faced tighter restrictions under the Obama administration, after Congress approved a law in 2015 that tightened the Visa Waiver Program for travelers from those countries, requiring them to apply for a visa when traveling to the U.S. Many decried the order as an act of Islamophobia, since it focuses on Muslim-majority countries and gives preferential treatment to Christian refugees. Those who have successfully carried out deadly attacks in the U.S., have also not come from the countries on the list, with NPR reporting that they’ve come instead from Saudi Arabia, Egypt, Lebanon, United Arab Emirates, Pakistan, Russia and Kyrgyzstan. After the executive order’s issuance, several on-campus rallies were held at schools across the island, with Hofstra University and Stony Brook University holding demonstrations of solidarity. More than a dozen interfaith religious leaders and political leaders also gathered outside the state Supreme Court Building in Mineola last week to denounce the order. At the ICLI, Khan said there’s “no other conversation going on,” except those about the executive order. A community forum will be held on Wednesday, Feb. 15, at 7 p.m. at Westbury Middle School, to discuss the effects of the executive orders, as well as concerns for minority communities. The moderated forum is open to all. For more information call 516-333-3495.